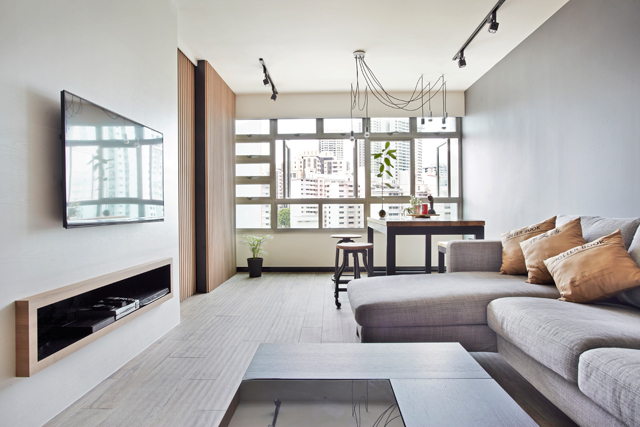 This living room has a neutral colour scheme of grey and white with complementing flooring. But it has stylish hints of texture in the form of wood accents. Following an open concept, the living room and dining area flow smoothly in as you enter. The living area is simple and elegant with a seating area, a wall mounted TV with a slim built-in console. It also accommodates one wall with built-in cabinets in a natural wood finish. The dining area has large windows that bring in plenty of natural light. Textured wood panels make an interesting feature. Rustic and industrial looking dining furniture add character to this space, while a contemporary light fixture completes the look. The kitchen is gallery style, with one wall fully lined with built-in cabinets in the same natural wood finish. The other side houses more cabinets with a black countertop. The stainless steel backsplash brings in an element of the industrial look. There’s also a tinted glass dry-erase board which is a cool feature.